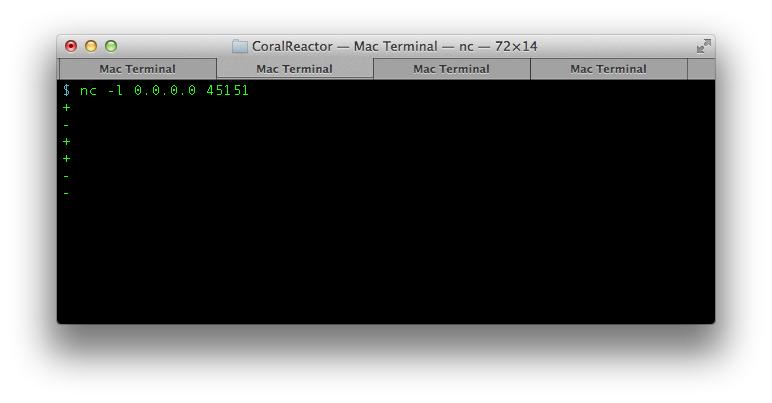 CoralReactor was built on purpose, from the ground up, to be single-threaded. That means that no other thread besides the reactor thread should be executing any code or accessing any data belonging to servers and clients. This not only provides super-fast performance but also allows for much simpler code that does not have to worry about thread synchronization, lock contention, race-conditions, deadlocks, thread starvation and many other pitfalls of multithreaded programming. However there are common scenarios where other threads must interact with the reactor thread. In this article we analyze in detail how this is done, without breaking the single-threaded design principle and without creating any garbage. Below we list the source code of a simple reactor client that increments a counter based on messages it receives from a server. So far so good. Note that we are printing on the log message the name of the thread doing the increment/decrement on the counter, in this case the NioReactor thread. Please don’t. That will introduce lock-contention on the critical reactor thread and attest your departure from the single-threaded design principle. Fortunately CoralReactor can easily restore the single-threaded principle through the use of callbacks. Now when we run our client we don’t see the main thread anymore, just the NioReactor thread. We have successfully restored the single-threaded design principle, but at a cost. We are creating garbage on every callback at line 18. Fortunately CoralReactor can easily fix that by using an underlying lock-free queue that produces zero garbage, thanks to CoralQueue. Note that you must initialize the queue before the reactor is started. Then all you have to do is use your callback listener class to get a callback object and dispatch it. CoralReactor was built from the ground up to be single-threaded by design. Therefore you should never allow multiple threads to share state with the reactor thread. If communication among threads becomes necessary, callbacks should be used so that the reactor thread is the only one executing the code. By using CoralQueue under-the-hood, CoralReactor allows for ultra-fast, lock-free and garbage-free callback handling.